MG University CAP 2014 allotment schedule (Revised) has been published. 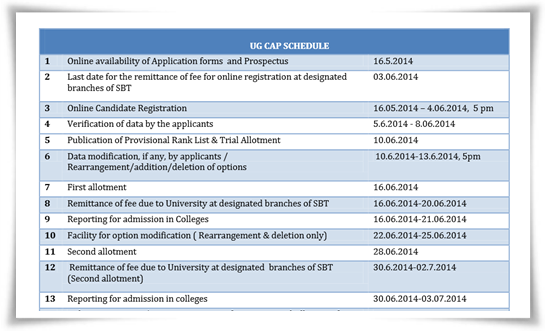 As per the revised schedule, the provisional rank list & trial allotment would be published on 10th June 2014 at www.cap.mgu.in, official website of CAP. The allotment timetable will help the students and parents to know the important dates regarding the CAP process. Read more to know about the MG University CAP 2014 allotment schedule. Mahatma Gandhi University, Kottayam has published the CAP 2014 allotment schedule (revised). As per the revised schedule, the provisional rank list & trial allotment would be published on 10th June 2014 at www.cap.mgu.in, official website of CAP. The allotment timetable will help the students and parents to know the important dates regarding the CAP process. Other than keeping a view on the allotment calendar, it will help the students to prepare themselves for a new academic year. The major highlight of the CAP 2014 allotment schedule is the availability of complete information regarding the process of admission. According to the scheduled timetable, the trial allotment would get published on 10th June. Students can modify, rearrange options from 10th to 13th June giving ample chance for them to being changes in the decision. In the next stage, the first allotment will be published, as scheduled on 16th of this month. With the simple and ease method, the candidates who had applied for the courses can check the trial allotment by logging in the official CAP portal of the University. Even though, the trial allotment will not ensure the students a seat, it would give them an idea about the chances of getting allotment to a degree course in a college. After the period earmarked for revising options (10th to 13th June), first allotment list will be published in the www.cap.mgu.in, official website of the University to publish CAP results. The allotment can be verified in their UG CAP profile page, by logging in with the application number and password. After the completion of the allotment process, the classes will commence on 9th July 2014. The important dates of the M G University CAP schedule 2014 are given in a null shell. As the University has decided to introduce new courses, there will a marginal increase in the number of seats allotted for the current year. The University will be in taking more students adding more to the existing 21,000 seats. All the seats in government colleges will be filled through CAP, 70% of the seats in aided colleges and 50% in unaided colleges will come under the single window system (SWS). Over 6,000 seats will be reserved for science courses under the Centralised Allotment Process (CAP). The B.A programme in economics has the highest number of seats with about 1,941 seats available in various affiliated colleges. Find Mahatma Gandhi University CAP 2014 allotment schedule (Revised) here.